Washington is accessible from Highway 17 from points north and south; Highway 264 from east and west. Washington is located approximately 20 miles off the Intercoastal Waterway. Click here for information about docks and slips. From some points east, you may use the NC Ferry System. 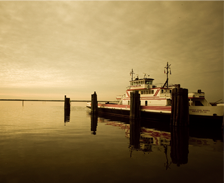 The Bayview Aurora Ferry crosses the Pamlico River just east of Bath. Click here for a PDF ferry schedule. Once you get here, you don’t have to worry about transportation. Everything in downtown Washington is only a short beautiful walk away!